Does revival come only in great soul-shaking outpourings of the Spirit? "NO!" says Norman Grubb. Revival is within reach of everyday people and can be experienced in your heart, home and church. Follow the author as he takes you through his experiences and the effect on his life of brokenness and ongoing personal revival he found as a result of his exposure to the revival movement in Rwanda, Africa, in 1950. 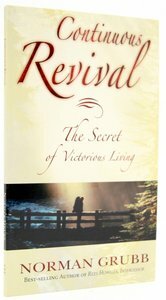 Learn the working secret which brought continuous revival to thousands over a period of sixteen years. Not mere theory, but personal experence! Read this book and let the reviver do His work in you.